Home / Data / DMR / IP / IPv4 / MOTOTRBO / What are bursts and frames in MOTOTRBO? 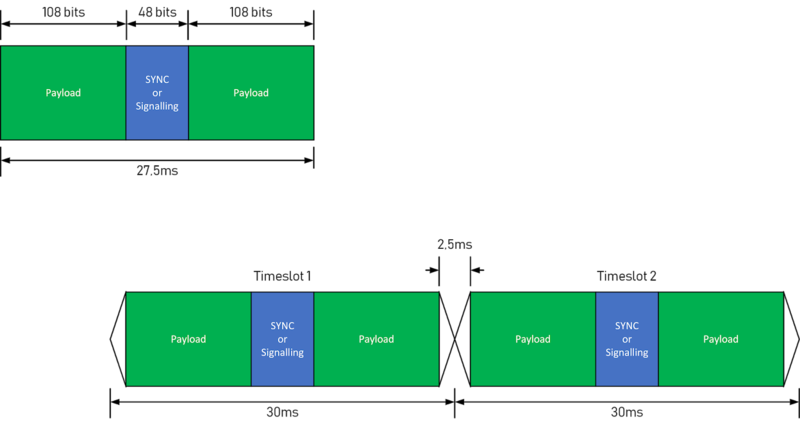 A DMR TDMA burst consists of two 108-bit payload fields, with 48 signaling or synchronization bits in the middle. The duration of each burst is 27,5ms - this leaves a 2,5ms gap between each burst in a frame. A frame consists of two bursts - one on timeslot 1 and the other on timeslot 2. The 2,5ms gap between slots is needed to allow the transmitting radio's (or repeater's) PA to rise to full power. Its also needed to prevent a nearby radio transmission on one slot from encroaching onto a distant radio transmission on the adjacent slot. Since each burst can pass 216 bits and since it takes 60ms to send the burst, 3600 bits can be passed between radios in a second. Because of scheduling and overhead, only around 1kbps of data transfer can be practically achieved on a radio system. Since voice generally has priority over data, a busy radio system will generally pass less data. Interference and poor sognals would have the same effect. Because UDP is inherently used in DMR, retry and CRC needs to be handled by the devices or applications at each end. DMR also uses IP so nothing special is needed to handle IP-based data. If you would like to try this out, the folks from ElcomPlus (the makers of SmartPTT) have a freeware application that allows files to be transferred over a MOTOTRBO radio network - this application can be downloaded from their website. Could you tell me in what form does repeater send recieved voice to the Application srver: as coded data by vocoder or as voip packets? On the IP link, it’s the same format/structure, just with some IP headers added. No transcoding happens in the repeater. Only the radios and application server do vocoding. I have faced with a problem in my Capacity Plus System. Received audio from application Console is not so good as from Radio. Application Developer persuades me that Motorola applies additional means in Radios for audio recovery besides standard vocoder. Can you comment this statement? There is some level/frequency response tweaking done, but only if one of the User Selected Audio Profiles is selected, otherwise it's all standard AMBE+2. Ok. Thank you very much for you help.